The growth of Northern Territory's (NT) agriculture, forestry and fishing industry is a useful indicator to reflect economic activity in the NT's regional and remote areas. It has important linkages to other sectors of the economy, including retail and wholesale trade, manufacturing and transport. In this section, analysis is provided on activity and production for live cattle and buffalo exports, as well as other livestock products and exports, horticulture, fisheries and forestry. 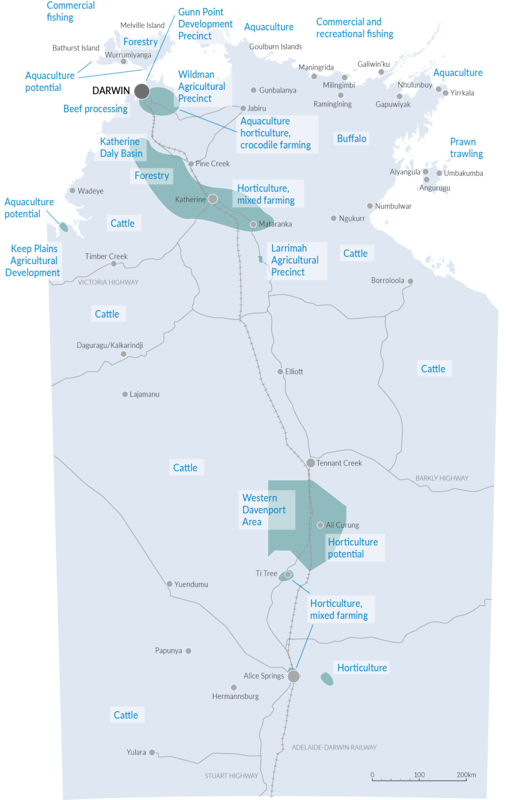 The agriculture, forestry and fishing industry is a significant employer and source of economic activity in regional and remote areas of the Northern Territory (NT). The industry has important linkages to other sectors of the economy, including retail and wholesale trade, manufacturing and transport. 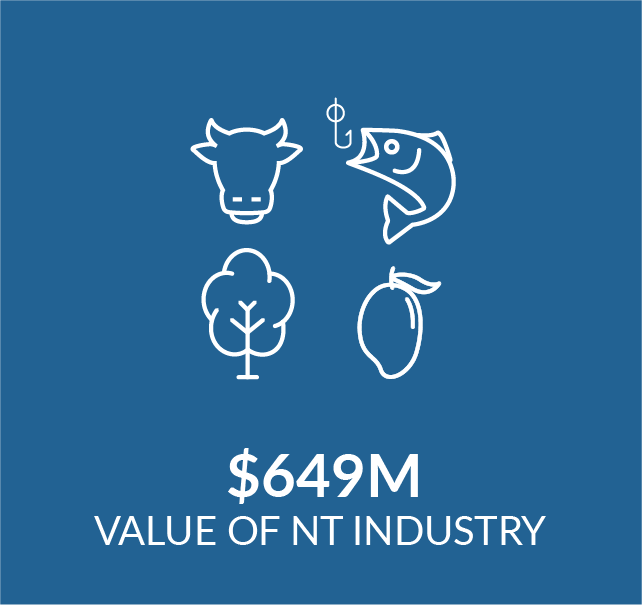 In 2017-18, the agriculture, forestry and fishing industry contributed $735 million in real terms to the Northern Territory’s (NT’s) economy. As a percentage share of gross state product (GSP), the industry contributed 2.9% in 2017-18, above the 10 year average of 2.3%. The industry’s output can, however, vary significantly from year to year due to changes in production as well as seasonal conditions, and changes in global and domestic demand for NT commodities. 1 This map is produced from various sources. Department of Treasury and Finance cannot guarantee the accuracy, currency, or completeness of the information. To be used as a guide only. The Australian Bureau of Statistics (ABS) employment data for the NT’s agriculture, forestry and fishing industry can be highly volatile due to the small sample size of the labour force survey, particularly in regional and remote areas. In 2017-18, the agriculture, forestry and fishing industry accounted for 1.3% or 1,743 of the total resident workforce, below the 10‑year average of 2.0%. 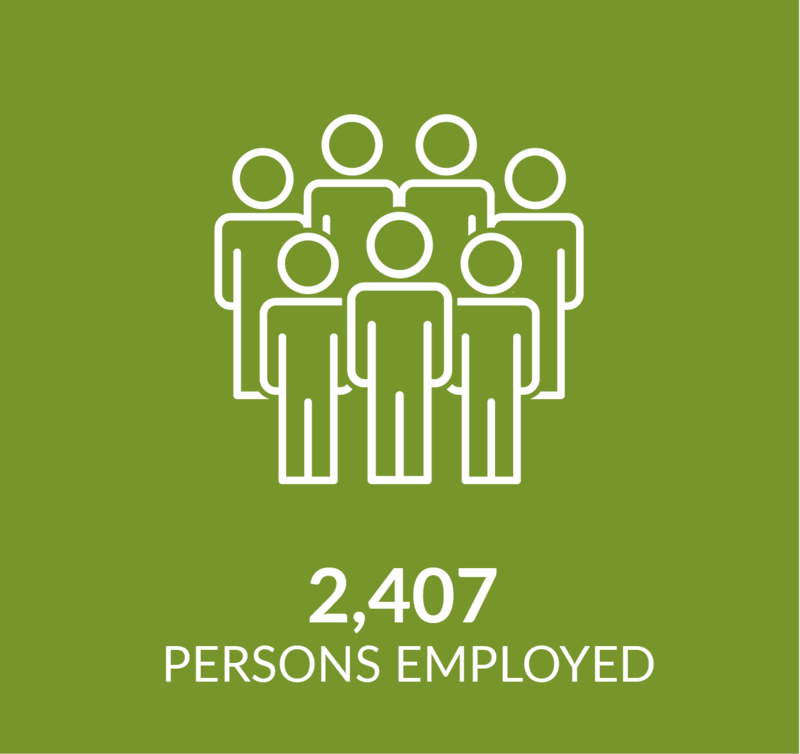 Since then, recent data shows the employment in this industry increased to 1,924 persons in the year to November 2018, representing 1.4% of the total resident workforce. Nationally, the agriculture, forestry and fishing industry decreased by 24.5% to 245,704 people over the same period, however the proportion to total national employment remained unchanged at 2.6%. The cattle industry is important to the NT economy, with the industry generating expenditure on cattle transport, stock feed, wages, port charges and demand for services such as quarantine inspection and veterinary requirements. In turn, this provides significant employment opportunities, particularly in regional parts of the NT, along with substantial export income, which supports regional economic growth. The live cattle industry in the NT consists of live cattle exported internationally and interstate. In 2017-18, about 492,400 head of live cattle were exported interstate and to overseas markets (Chart 2). This was a decline of 5.8% (30,378 head of cattle) compared to the previous year, which was mostly driven by a drop in interstate live cattle exports. International live cattle trade figures do not include NT cattle exported through ports outside the NT. The NT exports live cattle to a number of countries, most of which are located in Asia. Indonesia is the NT’s largest overseas destination, accounting for 76.1% (178,695 head) of live cattle exports in 2017‑18 (Chart 3). Other significant overseas export destinations for NT cattle include Vietnam, which accounted for 13.9% (32,616 head), and Malaysia, which accounted for 6.0% (14,087 head). In 2017‑18, international live cattle exports from the NT increased by 14.3% to 234,726 head, underpinned by a reasonable northern wet season and more favorable pricing conditions. This supported an increase in live cattle exports to Indonesia (up 9,155 head), Vietnam (up 7,693 head), Malaysia (up 5,242 head) and Philippines (up 4,579 head). In 2017-18, live cattle exports to Indonesia increased by 5.4% to 178,695 head. This, however, remains well below a recent high of 244,630 head in 2015, which has declined in recent years due the high cost of cattle in Australia and Indonesia’s 5:1 feeder-breeder policy. In response to high prices, Indonesia allowed the import of frozen buffalo meat in 2016 as a substitute for low value beef products. In May 2018, Indonesia issued permits for 100,000 tonnes of frozen buffalo to be imported, which is equivalent to 500,000 head of live cattle, or about half of Indonesia’s total cattle imports. Steady demand from Vietnam has supported live cattle trade out of Darwin, and is now the NT’s second largest live cattle export destination. In 2017-18, live cattle exports increased by 30.9% to 32,616 head, which the Department of Primary Industry and Resources value at about $19.6 million. Lower cattle prices in Australia resulted in trade to the Philippines resuming in 2017-18, with 4,579 head of live cattle exported, up from zero head in 2016-17. In 2017‑18, the number of NT cattle sent interstate decreased by 18.8% from 317,391 head to 257,713 head. This was mainly driven by a decline in live cattle exports to Queensland (down 30.8% to 136,003 head), New South Wales (down 18.7% to 12,735 head) and South Australia (down 3.5% to 61,359 head), which was partly offset by an increase in exports to Western Australia (up 46.5% to 28,848 head). Though parts of Queensland emerged from years of drought, which led to increased demand for NT cattle in 2016-17, about 57% of the state remain in drought conditions. These dry conditions have attributed to a decline in feeding availability and decreased demand for live cattle. However, Queensland remained the NT’s largest interstate live cattle destination, accounting for 52.8% of all NT cattle transported interstate. South Australia was the second largest export destination, with a share of 23.8% (61,359 head). In 2017‑18, the number of live cattle sent to the NT increased by 10.6% to 184,341 head. The majority of live cattle imports to the NT were from Queensland, which accounted for 79.8% (147,157 head) of interstate imports. The remaining live cattle came from Western Australia (33,937 head), South Australia (2,630 head), New South Wales (559 head) and Victoria (58 head). In August 2018, boxed beef production in the NT ceased following the closure of Australian Agricultural Company’s (AACo) Livingstone abattoir outside of Darwin. This was mainly due to high cattle prices, falling demand and a tightening in supply. However, production is expected to recommence by April 2019 with the re-opening of Central Agri Group’s Batchelor meatworks plant. Other livestock production in the NT is dominated by crocodile production. NT crocodiles are highly valued for their skins, which are used in the production of high‑end market fashion accessories such as handbags, belts, shoes, wallets, jewellery, entire skins and other fashion items. Australia accounts for 60% of the global trade in saltwater crocodile skins. In 2016‑17, total revenue from the NT’s crocodile industry was about $23 million, a decrease of $7 million from the previous financial year. Due to stricter grading standards, there were fewer first grade crocodile skins sold in 2016-17, while a greater quantity were classified as lower grade skins. Around 50.3% of this revenue was generated from the production of first grade skins (Chart 4). Around 44 full‑time, permanent employees and a further 44 casual employees were employed in crocodile farms in the NT in 2016‑17. Under the Crocodile Wildlife Trade Management Plan 2016‑2020 (WTMP), the NT Government plans to reduce regulatory red tape and provide certainty around quotas. The WTMP supports the growth of the industry by allowing an annual harvest ceiling of 90,000 viable eggs and 1,200 animals a year, doubling the number of saltwater crocodiles that can be harvested from the wild. Live buffalo is an emerging export market for the NT which has been showing signs of strong growth in recent years. Buffalo exports from the Port of Darwin increased by 28.4% to 10,254 in 2017-18, the highest result on record (Chart 5). Since Indonesia lifted its suspension of live buffalo exports from Australia in early 2017, the nation has become the NT’s second largest importer of live buffalo, accounting for 25.5% of total exports (2,612 head) in 2017-18. Before the 2011 suspension, around 3,000 head of buffalo per year were exported to Indonesia. Similarly, Malaysia resumed live buffalo trade in mid-2016, importing 2,199 head from the Port of Darwin and accounting for 21.4% of all overseas live buffalo exports from the NT in 2017-18. The largest importer of live buffalo is still Vietnam, accounting for 42.1% of total live buffalo exports (4,321 head) in 2017-18. $5.5 million for other vegetables production (Chart 6). The NT mango industry accounted for 34.9% of the total value of farming production (not including forestry). In 2016, mango production in the NT increased by 3,200 tonnes to 29,700 tonnes compared to the previous year. However, despite increased production, the total value of mangoes sold declined by $200,000 to $88.3 million. This change could be attributed to above average temperatures delaying production. Likewise, production of melons in 2016 increased by 5,400 tonnes to 56,400 tonnes, but gross value produced fell by $2.3 million to $50.3 million. In October 2017, a shipment of mangoes was exported from Darwin to Singapore for the first time in about a decade. Instead of transporting mangoes to Brisbane to be flown to Singapore, the direct flight gives growers ready access to a new market. For more information, visit the Plant diseases and pests information page on the DPIR website. The following section uses the latest available data on the fisheries industry as of March 2018. Crustacean production in the NT is dominated by prawns and mud crabs. Fish production largely comprises snapper, barramundi and mackerel. Aquaculture in the NT is primarily related to pearls and barramundi, with a small contribution from aquarium fish and spirulina production (the latter is used as a human diet supplement and a feed supplement in the aquaculture, aquarium and poultry industries). In 2017, the commercial fishing industry had more than 230 commercial fishing licences, 192 registered fishing vessels and harvested about 6,000 tonnes of fish and marine life each year. There was commercial activity in 15 different wild harvest fisheries. In 2015‑16, the estimated value of wild caught fish in the NT was $34.8 million (excluding prawns), with aquaculture products contributing a further $24.5 million. Environmental factors, such as low rainfall, have affected production of barramundi and mud crabs with pearl production affected by reduced global demand. The lower inshore fisheries production was significantly offset by growth in prawn and offshore fish production over the same period. Sustained growth in snapper production is expected to support a modest increase in fisheries production in the NT in 2016‑17. The Northern Prawn Fisheries (NPF) reports the number of prawn catches in northern Australia, in the area between Cape York in Queensland and Cape Londonderry in Western Australia. The NPF produces four common commercial species of prawns including white banana prawns, tiger prawns, eastern king prawns and endeavour prawns. The weather and ocean conditions, particularly the level of rainfall during the wet season, are very influential on the productivity of the fishery especially for banana prawns. In 2015‑16, NPF reported the total catch of prawns in the NT was about 3,796 tonnes. This comprised approximately 2,557 tonnes of tiger prawns, approximately 839 tonnes of banana prawns, approximately 398 tonnes of endeavour prawns and 3.2 tonnes of king prawns. There was a 112.4% increase in the total catch of tiger prawns in 2015‑16, as the 2015 tiger prawn season was the largest in almost 20 years with around 3,295 tonnes caught across fisheries in the NT (compared to around 1708 in 2014). The CSIRO suggests that the lack of rain may have spurred tiger prawn levels with reduced freshwater in the nursery areas and more favourable conditions in the spawning grounds. The total catch of banana prawns decreased by 49.6% in the NT due to a fairly dry wet season over the last few years (Chart 7). There are currently three plantation forestry projects in the NT. Plantation forestry is becoming an increasingly important industry and is currently the second largest production land user in the NT after cattle grazing, with more than 49,500 hectares of the NT currently used to produce forestry products in managed plantations. Up to 27,859 hectares of Acacia mangium is being grown for woodchip on the Tiwi islands. The forestry is managed by the Tiwi Plantations Corporation on Melville Island, and is an important source of income and employment for the Tiwi community. A total of 171,324 tonnes of Acacia woodchips were sold from the Tiwi Islands in 2016-17, with a total export value of around USD$11 million. Quintis is a company that manages Indian Sandalwood plantations in the NT. In 2017, up to 5,848 hectares of Indian Sandalwood were being grown by Quintis in the Katherine, Douglas Daly and Mataranka regions of the NT. All Quintis sandalwood plantations in the NT were still too young to be harvested, resulting in no product sales for the 2016-17 financial year. Quintis was given major project status by the NT Government in 2016, but entered external administration in early 2018. Approximately 14,000 hectares of African mahogany is being grown in the Douglas Daly region by African Mahogany Australia, which makes it the largest plantation estate of this species in the world. It is being grown for a high‑value, sawn timber market, which includes veneer boards, floor boards and feature grade timber. The estate is less than 10 years old, which means there is no commercial harvest yet and it is grown without irrigation. The analysis is based on estimates from surveys undertaken by the NT Department of Primary Industry and Resources (DPIR), information from a survey undertaken by the NT Farmers Association in 2016, as well as preliminary data from the ABS on the value of agricultural commodities produced. Caution is advised when interpreting annual changes in the value of production for commodities reported in this chapter. This is due to changes in the scope and coverage of producers in the survey, changes in the level of detail on commodities reported by producers, large percentage changes from a small base and one‑off weather events occurring in the NT and adjoining states. For more data on agriculture, forestry and fishing, refer to DPIR's website.